Oracle R Enterprise includes several components on the server. Together these components enable an Oracle R Enterprise client to interact with Oracle R Enterprise Server. Before installing Oracle R Enterprise Server, verify your system environment, and ensure that your user ID has the proper permissions. Oracle R Enterprise runs on 64-bit platforms only. · Oracle R Enterprise requires the 64-bit version of Oracle Database Enterprise Edition. Go to the Oracle R Enterprise home page on the Oracle Technology Network:. Select Oracle R Enterprise Downloads. On the Downloads page, select Oracle R Enterprise Server and the Supporting Packages for Linux. The following files are downloaded for Oracle R Enterprise 1.4.1. Oracle R Enterprise 1.4.1 Server. Copyright (c) 2012, 2014 Oracle and/or its affiliates. All rights reserved. Very recently, we have deployed ORE (R Distribution and R Enterprise) 3.1.1 packages on 4 node Exadata environment. This blog will discuss the prerequisites and procedure to deploy Oracle R Distribution v3.1.1. Note: Ensure you have a latest system (root and /u01) backup before you deploy the packages on the db server. R is third-party, open source software. Open source R is governed by GNU General Public License (GPL) and not by Oracle licensing. Oracle R Enterprise requires an installation of R on the server computer and on each client computer that interacts with the server. 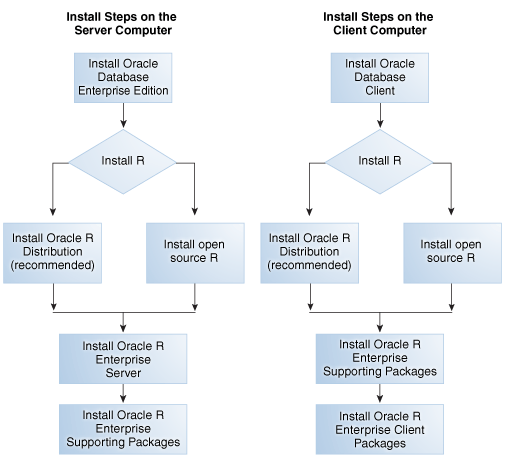 Oracle R Distribution simplifies the installation of R for Oracle R Enterprise. Oracle R Distribution is supported by Oracle for customers of Oracle Advanced Analytics, Oracle Linux, and Oracle Big Data Appliance. What is needed for R Distribution deployment for Oracle Linux 6? type q() to exit from the R interface. And repeat on the rest of the db nodes, if you are on RAC. In the blog post, I will demonstrate how to configure Oracle R Enterprise.